Anorexia is about control. 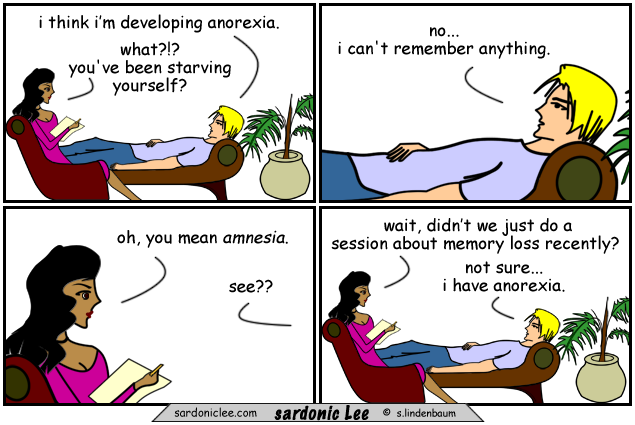 Amnesia is about lack of thought control. Koolette is all about control. Now, look into my eyes, keep looking into my eyes. You are getting sleepy. Very very sleepy. Well… Lee didn’t forget it’s called anorexia. 😉 Nonetheless, the brilliance of these comics are unforgettable! Smells like Anorexia Nirvana. Wait, what were we talking about?